In the wake of change there's darkness and fire. Give me a splinter from yesterday's words. Make that simple dream and flight come true. I came from the stars. 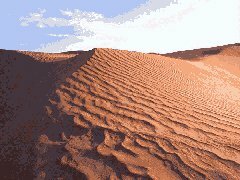 The sand dune is from a photograph of unknown origin.